SpinSheet Staffer Favorites Want some local knowledge about Annapolis and all the best spots? We’ve got you covered. On Land Chances are you’ll be looking for some peace and quiet after the rush of the boat shows or regattas or whatever brought you here. But if you’re not from the Annapolis area, it may seem like the whole town is bustling. We’ve narrowed down some of our favorite quiet hideaways to get you started. Take a hike. Quiet Waters Park is only about 15 minutes from downtown Annapolis, just off Hillsmere Drive and has great walking and running trails. There is also a dog park and stunning views of the South River. Bikes, kayaks, and stand-up-paddleboards are available for rent from Paddle or Pedal. Find some quiet. The Maritime Republic of Eastport is just a short walk across the Spa Creek Bridge and is another great place for some respite. At the end of almost every street there is a bench beside the water or you can try the docks at the Annapolis Maritime Museum, at the end of Second Street. Eastport is perfect for leisurely strolls where you’ll find restaurants, historic homes, maritime business, and marinas. Back downtown, we also enjoy walking around State Circle and the Naval Academy after sunset (make sure you have a photo ID handy). Read a book. Old Fox Books is one of our favorites, and is well worth the short walk up Maryland Avenue. The atmosphere is welcoming; they have a full selection of used and a cozy café where you can get a nice cup o’joe to enjoy your new read. 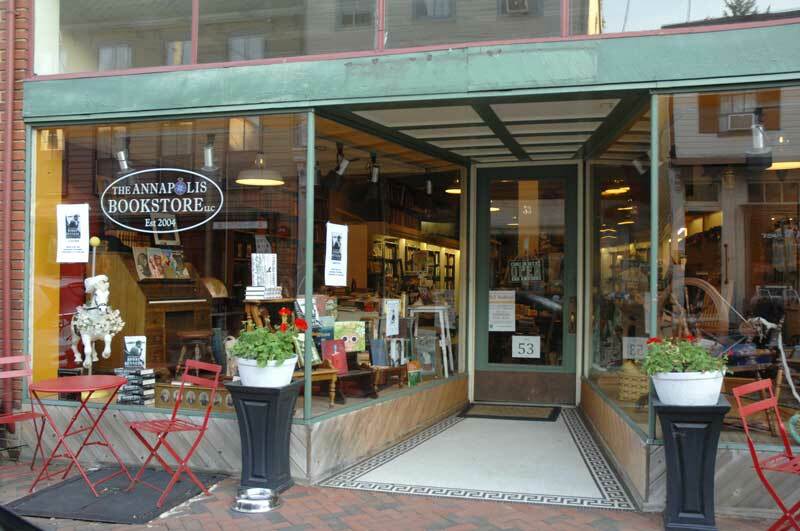 We also recommend the nearby Annapolis Bookstore on Maryland Avenue and Back Creek Bookstore on Main Street, specializing in out of print books, with an emphasis on naval history and nautical material. Take in some history. Tour the Hammond-Harwood House on Maryland Avenue or the William Paca House and Garden on Prince George Street. And overlooking Brokerage Cove is the historic Charles Carroll House where you can inquire about a private tour. Go shopping. Annebeth’s on Maryland Avenue has a great selection of wine, beer, chocolate, and fun gifts. And Maryland Avenue is just great in general. You will be amazed at the number of independent shops and friendly people. There’s even an old-fashioned barber shop. Right around the corner, check out Re Sails for great sail canvas gifts, from bags to deck chairs, even. On Main Street, Seasons has superb olive well for the culinary-inclined and you will be sure to walk out with a fun, funky hat if you venture into Hats in the Belfry. And Paws Pet Boutique on State Circle has the best dog collars around. If you venture a little farther out of town, we all love K&B True Value. They have everything, from flashlights to kitchen gadgets. And of course there’s Annapolis Maritime Antiques in Eastport—a museum and boutique in one. For nautical shopping, stop into Helly Hansen on Main Street and Sperry on Market Space, Fawcett Boat Supply on Bay Ridge Avenue, Annapolis Performance Sailing and Weems & Plath in Eastport, and West Marine on Hillsmere Drive or Jennifer Road. Take a walking tour. Even sailors who have visited Annapolis many times could learn something new. The Four Centuries Walking Tour is offered twice daily, 10:30 a.m. and 1 p.m., or try the Historic Ghost Walk, Fridays and Saturdays at 7:30 p.m. The U.S. Naval Academy Visitor’s Center also offers public guided walking tours on Mondays, Saturdays, and Sundays. Tour the Maryland State House. It is the oldest operating seat of government in the United States. You will need a photo ID to enter. Best Kept Annapolis Secrets (shhh don’t tell anyone): Crabs are usually half the price if you buy them from a waterman or seafood market (such as Wild Country Seafood in Eastport) and steam them yourself. The Annapolis Speedo Man (you’ll have to look this one up yourself). Many of the benches around Eastport have a little journal under the seat. Sit down, take in the views, and leave a note for others to read. The amazing views of the South River from Quiet Waters Park. The Starbucks in the basement of the Maryland Inn. The Circle Gallery on State Circle – artwork and photography from around the country, and it’s not maritime themed, so expect surprises. Annapolis Ice Cream Company –Grab a cone on Main Street and then walk up the staircase to the grounds of the State House. There are benches with great views and it’s surprisingly quiet. Waterfront Fun One of the best ways to experience Annapolis is by water. Most of us in the office are avid paddle-boarders and kayakers, though depending on the weather, October may prove a bit too chilly. But don’t fret, there are other ways to get out on the water and stay warm and dry. Check out the Miss Anne for cruises on Spa Creek and the Schooner Woodwind for tours around the Harbor. And this year, the Woodwind is offering a special sale: $41 adult tickets ($31 children under 12, $25 children under 7) Friday through Monday, which include a 90-minute sail and same-day entry to the show. Tickets can be booked online from one to six days in advance (not the day of). Or, be your own captain and rent a Duffy Electric Boat on Spa Creek at 300 Second Street in Eastport through Annapolis Electric Boat Rentals (new owners! they're great!). Stroll the Navy seawall. A brick promenade wraps along the shoreline from the U.S. Naval Academy Visitor’s Center for approximately a quarter mile. If you’re feeling energetic, follow the water’s edge along the street and the Severn River. Ages 16 and older need photo IDs to enter the academy grounds. The Annapolis Maritime Museum located at 723 Second Street in Eastport has educational exhibits about the maritime history of Annapolis and the ecology of the Bay. There are also benches outside to snag a quiet moment by the water or you can grab a rod and fish from the museum docks. If the weather turns out to be mild, try to get out on the water. Annapolis Canoe and Kayak on Third Street in Eastport sells and rents canoes, kayaks, and SUPs and has a huge selection of water-related gear. Also be sure to stop by East of Maui Board Shop at their bigger, better store location (2444-G Solomons Island Rd). for any and all of your watersports needs. If you’re really feeling adventurous, rent a kayak or launch your own and try your hand at kayak fishing. Dusk is a great time to go – you never know what you might catch and you can’t beat the Annapolis sunsets from the water. Davis’ Pub, at the corner of Fourth Street and Chester Avenue in Eastport, has been a favorite of locals, sailors, and watermen for years. This no-frills bar and restaurant was even featured on Food Network’s “Diners, Drive-ins, and Dives.” Try the crab pretzel. You won’t regret it, but your skinny jeans might. For a traditional Irish pub with a cozy dining area, friendly staff, and corned beef to die for, stop into Galway Bay on Maryland Avenue. Warm up with the specialty Irish coffee or try the house-brewed Lager and Ale. Fun fact: Galway Bay has consistently received the “Perfect Pint” award from Guinness. Vin 909’s unique dining room and menu, craft beer selection, wine list, friendly staff, and brick-oven baked pizzas make it one of our favorites. After the Wednesday Night Races, or just about any time, local sailors love to congregate at the Boatyard Bar & Grill on the corner of Severn Avenue and Fourth Street in Eastport. 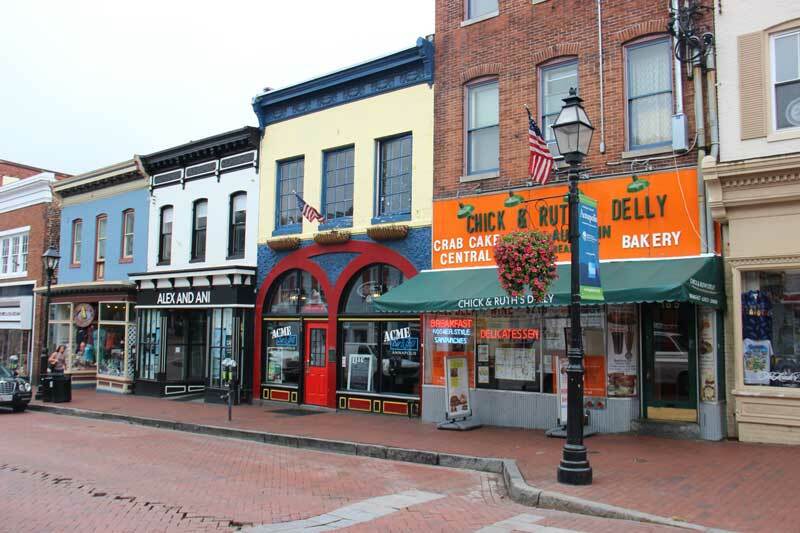 Quintessential Annapolis with a casual, nautical décor and excellent raw bar. Chick & Ruth’s Delly on Main Street is always a great place to people-watch and you can’t beat the excellent food. Loosen your belt and try the Man v. Food challenge from the Travel Channel which entails finishing a six-pound old-fashioned milkshake and a one and a half pound colossal sandwich. One person, one hour, one sitting. Also on Main Street is Joss Café and Sushi Bar for delicious fresh sushi and saki. Treat yourself at Bakers & Co., a small family owned bakery and café specializing in fresh pastries and breads (excellent coffee too), located on Chesapeake Avenue in Eastport. Don’t leave without trying the Peach Crumble Muffin. And don’t forget the Leeward Market, our favorite neighborhood café at Second Street and Chester Avenue in Eastport. Sailor-friendly atmosphere with great breakfasts, fresh salads (try the Greek), and outdoor picnic tables. If you’re in need of some pampering, head over to Red Red Wine Bar. This place is a transcontinental journey in a glass, with selections changing daily. Sit at the swanky counter and unwind with a glass of vino after a long day walking the show. Stan & Joe’s Saloon on West Street is great if you’re looking to escape the main street crowds. It’s all locals here (but we’ll make an exception for you), the bartenders are great, and the happy hour specials can’t be beat. Also on West Street, you’ll find the Metropolitan Kitchen and Lounge—excellent food, hand-crafted cocktails, and a rooftop seating area to die for—and the Rams Head Tavern. Daily happy hours and live music on the back patio or in the basement. And if you like oysters and interesting cocktails, try the Sailor Oyster Bar in "uptown." It's city chic, Annapolis-style.